Home » Borneo (Kalimantan) » The Muara Kuin Floating Market : Enjoy the market activity on the Boat. The Muara Kuin Floating Market : Enjoy the market activity on the Boat. Floating market is a place where you can witness or do activity in river market by using boat directly. 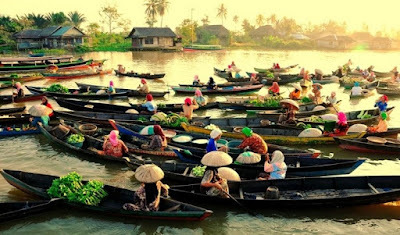 The floating market is located in Banjarmasin, exactly at the junction of the river of Barito and Kuin. Floating market in Banjarmasin is a reflection of Banjar culture that has been going on long time ago. In the south Kalimantan, there are a hundreds rivers that become the important transportation route until now. The tourism objects focus on the river, like floating market of Muara Kuin in Banjarmasin city. When the sun rises, go to this market that reflect the light in the morning between the transactions of vegetables and crops from villages along Barito river and its tributaries. The floating market of Muara Kuin is a traditional floating market located on the Barito river, Kuin river mouth, Banjarmasin, South Kalimantan. Traders and buyers use "jukung", the name of boat in Banjar language. This market is started after morning prayer until 09.00 o'clock. The specialness of this market is the barter system still used between Boating merchant (in Banjarnese called bapanduk). The woman traders (dukuh), which boating, sell their own production result, whereas the second hand that is bought from woman traders (dukuh) for later resel called "panyambangan"
Banjarmasin as the province mother city is a trade and tourism center. Banjarmasin city got the nickname as the City of Water because of its land location is a few centimetres below sea level. Banjarmasin city, has an area of ​​approximately 72 square miles or approximately 0.22 percent of the area of ​​South Kalimantan. This city is split by Martapura river that give the thew for the society life especially the utilization of the river as water transportation, commerce, and tourism. Besides floating market in Muara Kuin, Banjarmasin, the other floating market that can be visited is in Lok Baintan, which is located in Martapura river. In 1526 Sultan Suriansyah built a kingdom in the riverside of Kuin and Barito, which later will become Banjarmasin city. In the riverside, at first thrive a traditional trade center. The traders use small boat made from wood. These traders mostly is woman that use tanggui clothes and wide hat originally from banjar made from sago palm leaves. What Do You Can Buy ? Of course the tourism theme here is shopping and enjoying the atmosphere of traditional floating market. There are many goods you can buy here such as sasirangan fabric as a South Kalimantan handicrafts. Sasirangan fabric at the past is used as laung (headband), also functioned as belt which is used by men or as a shawl, veil, also udat (kemben). This fabric also as traditional clothes, which is used in tarditional ceremony, even used in treating the ill man. Nowadays, sasirangan fabric has a function as daily clothes, no longer used for traditional ceremony and this is a typical clothes from South kalimantan. The word "sasirangan" was came from word "sirang", which is means "tied" or "sewn" by hand and pulled its string. Sasirangan fabric is made by using material of mori fabric, polyester that sewn by certain ways. And then colored by many colours you want, so it result a fabric by the colorful line patterns. So, don't forget to buy it as your souvenirs. Besides the vegetable and fruit traders that sell their goods on the boat, also there are some floating food stalls. Soto banjar is typical food from Banjarmasin where we eat without rice but with lontong (steamed rice wrapped). Enjoy soto banjar from your boat while looking ships and boats passing. . In Banjarmasin city, exactly along A.Yani street Km 14, you can try typical culinary from Banjar such as soto banjar, ketupat kandangan, kelepon martapura or nasi itik gambut. Nasi itik gambut has very soft taste. The ingredients that is used is ingredient and seasoning by the quality number one. Nasi bebek gambut can easily found from Syamsudin Noor airport until Gambut. You can enjoy the atmosphere of floating market together with the society life that live along riverside by the typical atmosphere of Banjar village. Please come in the early morning to see the society busyness so it will become your own experience. The floating market of Muara Kuin is located in the mouth of Kuin river with Barito river and trading activities are started after dawn until 09.00 o'clock. You can see many kind of goods like vegetables, fruits, fresh fish, and also culinary. You can rent a boat, which is located along the riverside. The rent price is Rp 60.000,00. You can go around the river or buy something. You can use water motorboat or "kelotok" by the rent price approximately between Rp 50.000,00 - Rp 70.000,00 and it depends on the number of passenger. By using water motorboat you can see the culture of Banjar society that sell vegetables, cakes, original foods and drinks from banjarmasin like soto banjar. Besides floating market, try to visit Cempaka, an area of diamond and gold mining, about 47 km from banjarmasin. In this place in 1965 ever been found a dimonds by the weight of 166,67 carats, which is named as Intan Trisakti (The diamond of Trisakti). The result of diamond mining is usually traded in Martapura city. Besides of that, there are Swarangan beach and Batu Lima beach in Tanah Laut regency that you can visit. There are also Haratai waterfall, Riam Anai waterfall, Kilat Api waterfall and Tanuhi hot water. The access to South Kalimantan through Syamsudin Noor airport in Banjarmasin could be taken from Jakarta, Surabaya, and Yogyakarta. Floating market at the mouth of Kuin river and Barito river can be reached via two routes. The first route from banjarmasin city by using public transport and it needs 15 minutes only. You can start from Veteran street and then take the route of outwards city. Whereas the second route by using motorboat called kelotok. If you use kelotok boat, from Banjarmasin city to the floating market, it needs one hours.